Even if you’re already an expert at preparing healthy beef and pork at home, you’ll be pleased to find a couple of simple, elegant lamb recipes here that are sure to impress your friends and family! These healthy, delicious recipes will turn any night into a special occasion. In a shallow baking dish, combine the orange juice, orange zest, thyme, and pepper; mix well. Trim all excess fat from the lamb chops and place in a baking dish. Spoon the orange juice mixture over the chops; cover, and refrigerate for 3–4 hours, occasionally turning chops. Coat a large skillet with nonstick cooking spray; place over medium-high heat until hot. Remove the chops from the marinade, reserving the marinade; arrange in the skillet. Brown the chops on both sides, remove from the skillet, and set on a plate lined with paper towels. Reduce the heat to medium, add the mushrooms, and sauté until just tender. Stir in the reserved marinade and wine and bring to a boil. Return the lamb chops to the skillet; cover, reduce heat, and simmer for 10–12 minutes or until the sauce is reduced to about 1/2 cup. Transfer the lamb chops to a platter, spoon the orange sauce on top, and serve. Try serving these delicious orange lamb chops with baby peas or French green beans. Per serving: Choices/Exchanges @@bf1/2 Carbohydrate, 4 Lean Protein, 1/2 Fat; Calories 250 (from Fat 90); Fat 10g (Saturated 3.5g, Trans 0.0g); Cholesterol 95mg; Sodium 85mg; Potassium 510mg; Total Carbohydrate 5g (Dietary Fiber 1g, Sugars 3g); Protein 31g; Phosphorus 250mg. Marinating 1–2 days is the secret to a great leg of lamb. In a large ceramic, glass, or stainless-steel dish (anything but plastic), combine all the ingredients except the parsley sprigs; cover, refrigerate, and let marinate for 1–2 days, turning occasionally. After marinating, drain the lamb, discard the marinade, and pat dry. Season with salt, if desired. Place the lamb into a grill basket. Broil the lamb 3–4 inches from the heat for 15–20 minutes per side. Transfer the lamb to a cutting board and let cool slightly. 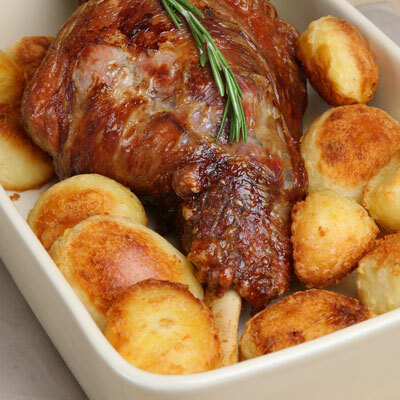 Carve the lamb diagonally; transfer to a serving platter, garnish with parsley sprigs, and serve. Serve with sautéed carrots and oven-roasted potatoes. Per serving: Choices/Exchanges 4 Lean Protein; Calories 200 (from Fat 70); Fat 8g (Saturated 3.2g, Trans 0.0g); Cholesterol 90mg; Sodium 75mg; Potassium 350mg; Total Carbohydrate 0g (Dietary Fiber 0g, Sugars 0g); Protein 29g; Phosphorus 230mg.